Put your feet in the water... Enjoy the Aqua Detox Experience!!! Enjoy the Aqua Detox Experience!!! The most effective way to re-balance, re-energize and detoxify the body without special diets, funny drinks or sweaty exercise. 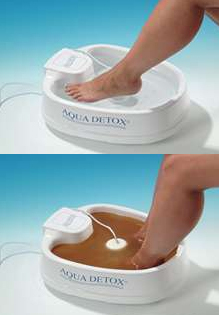 Aqua Detox is a unique therapy based on the research of Dr. Royal Rife, millions of ions enter your body through the feet and begin to detoxify your body. While you are relaxing, the water will immediately start to change color as millions of ions enter your body and begin to neutralize tissue acid wastes. The color change and sediment you see in the water is produced by the ionization interaction of the current flow; the metal in the array and the toxins in the water and body. Negative and positive ions attract toxins and are released from the body via OSMOSIS. This has a very effective way of cleansing the body from heavy metals and other toxins. The benefits of the Aqua Detox system are, detoxification, stimulation and balancing of the body’s energy meridians, and ATP production. ATP has natural body chemicals that extracts energy from your food and makes it available for numerous physiologic functions in the body. You will feel great, sleep better, and have more energy and improved outlook in life. 1 - If you have a pacemaker. 2 - if you have any metal pins or plates in the body. 3 - If you are pregnant. If you have none of these, your good to go!! !